A BREAKTHROUGH. Researchers from Montreal’s National Institute of Scientific Research (INRS) just published a study in Optica detailing a new approach to invisibility cloaking. Their device, called a spectral invisibility cloak, is the first to manipulate the color (or frequency) of the light waves that interact with an object, rendering it invisible. “Our work represents a breakthrough in the quest for invisibility cloaking,” study author José Azaña said in a news release. BREAKING IT DOWN. Let’s break this down, starting with light. There’s something called the electromagnetic spectrum. It contains all the different frequencies of electromagnetic radiation, a certain kind of energy. X-rays, gamma rays, and radar all fall somewhere on this spectrum. While you can’t see an X-ray, your eyes can see one small range of frequencies on the electromagnetic spectrum. We call this visible light. 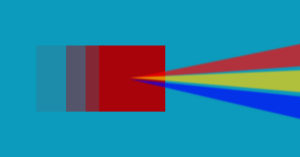 As mentioned, it’s a range separated into what we perceive as colors, with violet at one end and red at the other. Some light sources contain more than one specific frequency. We call these broadband sources, and sunlight is one example. When we “see” something, what we’re really seeing is the interaction of these light frequencies and the object. When sunlight shines on a blue car, the car reflects the blue light frequency while absorbing all the other frequencies. Our eyes detect the reflected blue light, letting us see the blue car. The INRS researchers’ cloaking device takes advantage of this interaction. They describe an object that reflects only green light. To make this object seem “invisible” to the human eye, they use a specially designed filter to temporarily shift the green frequencies in the broadband spectrum shining on the object to blue. Then, they use another filter to shift those frequencies back to green on the other side of the object. The result? The human eye can’t see the object. ANOTHER STEP FORWARD. Currently, the INRS researchers’ cloaking device only works from one direction — the viewer’s gaze needs to follow the path of the light, looking toward the object through the first filter. However, Azaña claims the method could theoretically make an object invisible from every direction. For now, the device could help secure telecommunications, which use broadband waves to transport data. Telecom companies could render certain frequencies along their fiber optic networks “invisible,” preventing third-parties from using broadband light to spy on them. Editor’s note 7/2/18 8:35 AM: This article previously mischaracterized what happens to light of other wavelengths other than the ones we see. It has been updated. We regret the error.